Erny, Erny (2005) Perbedaan komitmen berpacaran antara dewasa muda yang memiliki self monitoring ringgi dan self monitoring rendah. Skripsi thesis, universitas Tarumanagara. Commitment is the strongest predictor of persistence in an intimate relationship. The aim of this research is to find out the difference about commitment in courtship relationship between high self-monitoring individuals and low self- monitoring individuals. The whole subjects for this research are 127 individuals, which consists of 26 low self-monitoring individuals and 21 high self-monitoring individuals. Reporting the result, pursuant to level significant (0) 0.05, result of the research is t(45) = -0.683, p >0.05, with score of significance 0.498. 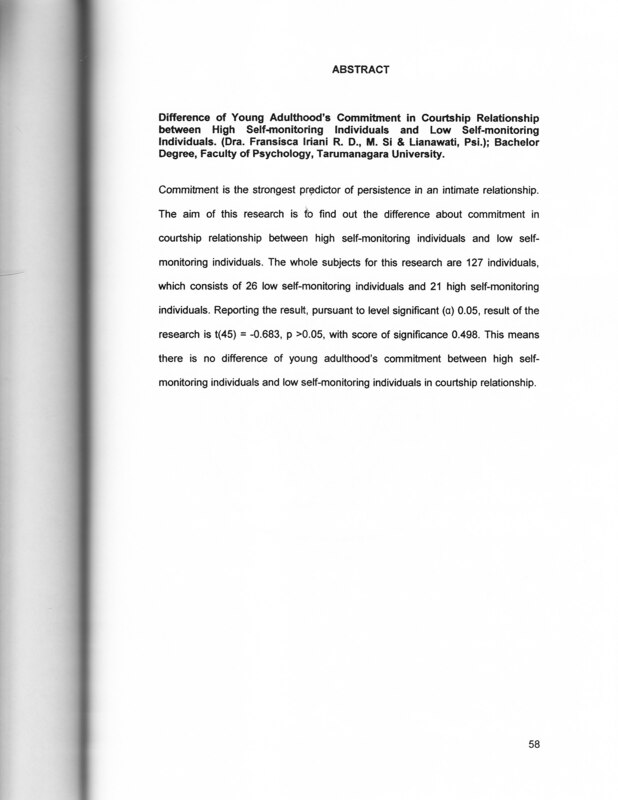 This means there is no difference of young adulthood's commitment between high self- monitoring individuals and low self-monitoring individuals in courtship relationship.